In 2018, the Florida Gator football team has a wide gap between its floor and ceiling. While this is often true of first-year coaches, it seems even more pronounced this year. On the one hand, Dan Mullen seems to be just the sort of coach to get the team out of its nearly decade-long rut. He was a major part of the last major run of success for the program, and he has nearly a decade of experience to lean on rather than being a hotshot up-and-comer with a short track record. Then again, it can be tough to break the inertia that the Gators have been dealing with. It can take a really good coach many years to change a culture of mediocrity, though I don’t think Florida’s in a huge hole in that regard. It could take more than just one good offseason, though. 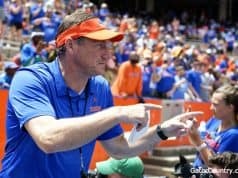 Many coaches, including Mullen’s old boss at UF, see the big jump in their second year, not their first. Here are what I see as the best and worst case scenarios for Gator football in 2018. Nick Savage’s strength and conditioning regime is as good as advertised. The players are faster, quicker, and have more stamina. 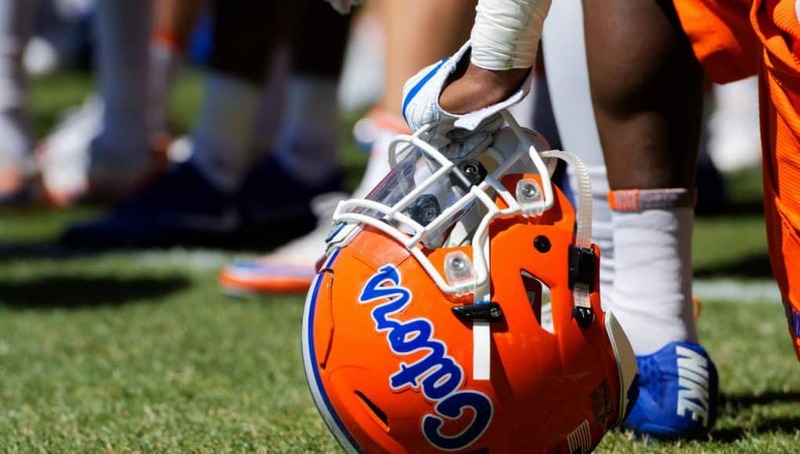 There is no late-season injury wave as UF has seen so often in the last five years. Simply having the best 11 on both sides available most of the time makes a big difference, and closing better in the fourth quarter gives the team an extra win or two. Nowhere does that physical improvement manifest more than up front on the offensive line. More strength and more zone blocking help them play a lot better, and they create big holes for the talented stable of running backs. They still get beat around the edge from time to time, but they give up a lot fewer sacks than last year. The quarterback play won’t improve to all-conference, but it goes from bad to solidly average. Either Feleipe Franks or Kyle Trask settles in as a game manager, smartly executing Mullen’s short passing attack while occasionally hitting one over the top. Emory Jones provides several explosive plays per game either with his legs or by handing off to someone left unattended due to the threat of his legs. The receivers are vastly improved with Van Jefferson and Trevon Grimes providing a pair of instant playmakers. Tyrie Cleveland remains a deep threat while becoming a more complete player, and Kadarius Toney becomes one of the country’s top slot receivers with his ability to juke defenders. Solid depth and blocking come from Josh Hammond, Freddie Swain, and Rick Wells, while Jacob Copeland’s role grows throughout the year as he gets up to college speed. Lucas Krull with his 6’7″ stature becomes a highly effective red zone target. The passing attack finally looks functional again. The defense doesn’t just improve but becomes scary again with Todd Grantham’s aggressive play calling. A seemingly endless parade of edge rushers — Cece Jefferson, Jabari Zuniga, Jachai Polite, Jeremiah Moon, Antonneous Clayton, Adam Shuler and more — set up camp in opposing backfields, while the young defensive tackles who played as freshmen last year blossom into disruptive forces thanks to the Savage treatment. Extra depth at linebacker from Ventrell Miller, James Houston, and Umstead Sanders reinforce the weakest link in the defense. They lack the raw talent to get to Florida’s usual standards, but the unit becomes serviceable. The older David Reese turns in an all-SEC performance, while the younger David Reese works his way into major snaps by November. It’s nearly impossible to throw on Florida’s corners, especially with new nickel corner Chauncey Gardner-Johnson no longer playing out of position as a safety. Jeawon Taylor and a rotation of contenders improve the safety spot, and the number of big plays allowed goes way down. Mullen’s renewed commitment to special teams pays off. The team actually flips the field occasionally with the return game, and Florida fans are reminded it’s legal for their team to block punts. A big special teams play factors heavily into a win somewhere along the line. After breezing to 3-0, the Gators take a big shot on Rocky Top but still prevail. Mullen edges out his former team by daring his old quarterback to beat him with the pass while knowing that he can’t, and UF completes its crucial three-game swing by beating LSU in front of an electric crowd in the Swamp. The team still loses but looks respectable against the more-talented Georgia, and it loses by a hair in Tallahassee. The Gators finish 10-2, and though UGA still wins the division, UF snags a bid to a New Year’s 6 game by finishing around tenth in the rankings. The players’ Savage-sculpted bodies make the uniforms look better, but they still struggle to turn athleticism into positive football results. A top-to-bottom philosophy change on offense never fully clicks in its first year, and while the defense is improved, it has some hiccups going from a 4-3 to a 3-4. Mental mistakes and penalties aplenty make the team infuriating to watch at times. The underwhelming offensive line of the past two years continues to underwhelm. The unit is plagued by breakdowns on its right side, and delayed blitzes get through untouched all too frequently. The run game struggles when Jordan Scarlett isn’t breaking five tackles per play, and the quarterbacks can’t stay clean on passes. As a result of unreliable play up front, the offense never finds an identity. And yes, I did say quarterbacks, plural. 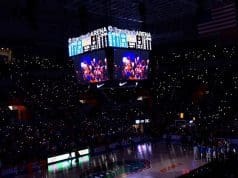 The light still does not come on for Franks, Trask struggles in his first college game action, and Jones is simply not ready to be a major contributor yet. Opposing defenses continue to load up on the run while unafraid of the pass, and none of the signal callers is able to make them pay. The receivers are improved, but they are wasted with another year of bad quarterback play. It doesn’t help that Jefferson, Grimes, Cleveland, and Toney all experience injuries just as they did last year. On defense, the edge rush is tremendous, but the middle of the defense is a weakness. The defensive tackles end up merely average, and no one is able to step up next to Reese and be a second quality inside linebacker. Opponents reliably pick up first downs with shallow crosses that take advantage of linebackers who are still lost in coverage. The current jumble at safety remains a jumble for the year, with guys coming and going from the lineup and never really differentiating themselves from each other. The renewed emphasis on special teams pays off in the return games, but the specialists are a downgrade from last year. Tommy Townsend just isn’t as good as his brother, which is no shame but also makes the punt game less effective. Evan McPherson gets a bad case of the yips as a true freshman, making the kicking game unreliable. The team starts off 3-0, but a loss to a massively motivated Tennessee team rattles them. They turn around and lose to a massively motivated and quite good Mississippi State team facing its former coach. LSU is able to come away with a win as the Gators reel from the back-to-back losses to the Vols and Bulldogs, knocking them down to 3-3. 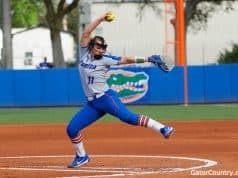 UF falls to more-talented Georgia and FSU teams, and South Carolina steals a close one in a cyclical up year for that program. Florida limps into the postseason at 6-6 with losses to all three major rivals and Will Muschamp, having never been able to find consistent success — provided they don’t also drop their contest against future first round draft pick Drew Lock and Missouri and miss making a bowl altogether.